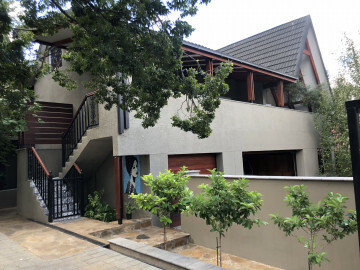 Bella Blue Guesthouse offers unique, upscale accommodation in the heart of Bloemfontein. Your gracious hostess, airy rooms and absolute attention to detail - will leave you yearning for a return visit. Bella Blue guesthouse is ideally situated in a quiet location but within close proximity to all major centres - making it perfect for business, solo travellers, couples and leisure guests. Bella Blue offers three exclusive rooms on an upper level to ensure maximum privacy. Rooms lead out onto a balcony each with its own tasteful seating area. A continental breakfast is included.